Los Angeles, Ca. (April 12, 2011) Folk music was born from a rich tradition of giving and openness-and no one has done more to bring that original spirit back to the genre in recent years than Chuck Ragan has with his Revival Tour. Ragan-who is well-known as both a solo artist as well as guitarist/vocalist for the legendary punk act Hot Water Music-conceptualized the idea for The Revival Tour in 2005, however it didn't come to fruition until 2008 when Ragan hit the road with Avail's Tim Barry, Lucero's Ben Nichols and a cast of revolving guests-including Against Me! 's Tom Gabel-for the tour's inaugural year. This year the tour will hit the UK and mainland Europe. Joining Chuck will be Brian Fallon from The Gaslight Anthem, Dan Andriano from Alkaline Trio and Dave Hause from The Loved Ones. Accompaniment by Jon Gaunt on fiddle and Joe Ginsberg on upright bass will round out the crew. "The most important part of The Revival Tour is the camaraderie and the way people are drawn to each other whether they're playing a mandolin, singing, playing fiddle or there to see the show," Ragan explains. "We live and breathe this music and I think it's just a natural instinct for people who believe and live music to want to share that with other like-minded musicians," he summarizes. Andvinyly come up with the genius idea of pressing your ashes into records. You can even record your own personal message on the vinyl. How cool would it be to have a Ramones track playing at your funeral and then a message from you at the end saying "so long suckers, now party". That's how I'm gonna go! You can even have up to 30 pressed to distribute via your friends and relatives! AndVinyly, the creation of English record label boss Jason Leach, offers the service for around $3500 so you can "live on from beyond the groove!" Your ashes, or ashes of parts of you, are pressed into as many as 30 records, a process that Mr Leach said was not complicated. Customers can supply audio, or choose music from the website's 'Raveyard', and then let their loved ones listen to a last message spinning around and around. Forever. While all this might sound a bit on the nose, Mr Leachsaid the response had been "huge". The inspiration came from "a desire to be immortal coupled with sadness at the decline in record sales and music you can touch back". The nostalgia of vinyl is part of the appeal. It’s certainly not something you can do with an iPod. Mr Leach came up with the idea after watching a TV program that showed an American having his ashes put into fireworks, which prompted him to wonder how he'd like to be remembered. "It's a bit more interesting than being in a pot on a shelf," he told Wired UK. A vinyl memorial was also more practical than scattering ashes, Mr Leach said. For example, there's no danger of a change in the wind sending the ash back over mourners, something that happened to his family at his grandfather's send-off. To complete the package, the website offers unique artwork for the 'Rest In Vinyl' album sleeve. National Portrait Gallery artist James Hague can paint your portrait for the cover, with your ashes mixed into the paint. Those wanting to share their memory with the world can even distribute the album through vinyl stores internationally. The service is also available for pets. I went to see Sonic Boom Six supporting The King Blues at the O2 Academy in Newcastle this week and a top evening it was. My mate Kevin was there reviewing it for With Guitars and I've gone and nicked this live review from their site as he pretty much sums it up. The King Blues were fantastic as well, although every time I see them the line-up changes. The songs they performed from their forthcoming album suggest that it's going to be as good as its predecessors. 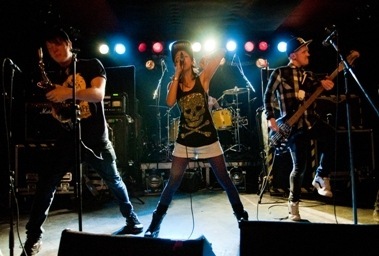 Sonic Boom Six returned to Newcastle for a sold-out show supporting The King Blues. Hardly strangers to Newcastle SB6 have an army of fans ready to greet them, from the first notes of ‘The Road To Hell…’ an enthusiastic mosh pit starts and only continues to grow as they play ‘Sound of a Revolution’ and the new single ‘New Style Rocka’ which Barney very admirably performs the rap by Tonn Piper. Two new songs are included in the set ‘Sunny Side Of The Street’ which is a slower more acoustic and far more commercial song than we’re used to and ‘For The Kids of the Multi-Culture’ which is preceded by a rant by Barney about the benefits of multi-culturalism in music – a bit pointless as he was preaching to the converted here. The set finishes with a rousing version of ‘Piggy In The Middle’, it’s been short and sweet tonight and true to form SB6 have given 100%. Many people have said to me that they’re surprised that SB6 aren’t far more popular considering how hard they work, how good the live shows are and how wonderful and original the albums are. You can add me to that growing list. If there’s any justice in the world their time will come.